Two days is hardly enough time to visit any Italian city let alone Rome, whose many treasures merit a lifetime of exploration. But for those on a limited schedule, this 48-hour itinerary of Rome’s highlights for a first-time visitor will offer a glimpse of the best of Rome’s epochs, including the ancient, Baroque, and the modern. 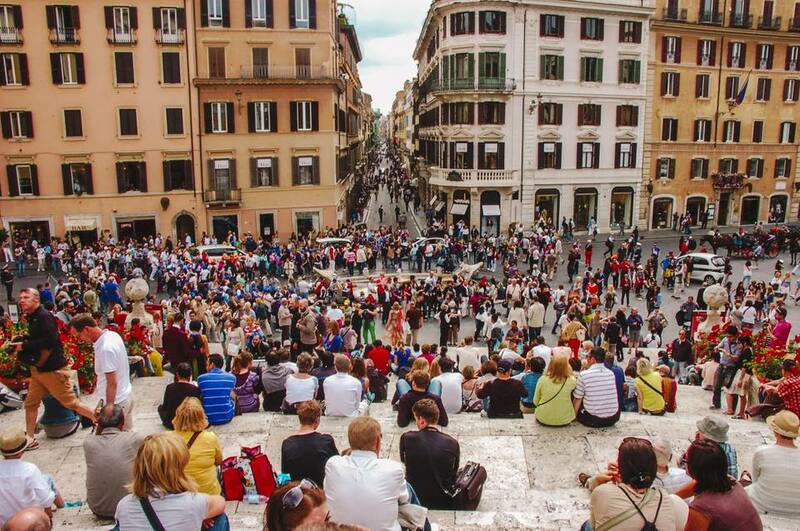 The most efficient way to see Rome in two days is to purchase the Roma Pass, a cumulative ticket that provides free or reduced rates for more than 40 attractions and includes free transportation on Rome’s buses, subway, and trams. The pass costs €25 (April 2010). A visit to Rome is not complete without a tour of some of its top ancient sites, including the Colosseum and the Roman Forum. Start your day at the Colosseum, whose sheer size and grandeur still impresses almost 2,000 years later. When it was inaugurated in 80 A.D., the Colosseum could hold up to 70,000 spectators, who came to the arena to watch gladiatorial contests and daring animal hunts. For an additional €4, you can rent an audio guide of the Colosseum, which provides a concise explanation of the ancient arena's history and construction. It would be easy to spend an entire day at the Roman Forum, which was the center of religious, political, and commercial life for ancient Romans. The most famous ruins of the Forum are the Arch of Septimus Severus, The Arch of Titus, the House of the Vestal Virgins, and the Temple of Saturn. Some of the excavations of the Forum date back to the 8th century B.C. The Palatine Hill includes ruins from the House of Augustus and the Stadium of Domitian, among other excavations. Entry to the Palatine is included in the Colosseum/Roman Forum ticket. From the Palatine, you can also see the Circus Maximus, famed for its chariot races. The Imperial Forums, across Via dei Fori Imperiali from the Roman Forum, contain the remains of Trajan’s Forum, the Markets of Trajan, and the Fora Augustus and Julius Caesar. Admission to the Imperial Forums is €6.50. Most of the eateries near the Forum cater to tourists, so the food quality is variable and the prices inflated. So I recommend going to Campo de’ Fiori for lunch. The lively square features a farmer’s market in the mornings and numerous dining options, including delis, wine bars, and full-service restaurants with seating on or near the piazza. After lunch, head to the Pantheon, Rome’s oldest, intact building and one of the best preserved ancient buildings in the world. This is also the burial place of the artist Raphael and Italy’s two kings, Vittorio Emanuele II and Umberto I. The Pantheon sits on Piazza Della Rotonda, near which are some delightful churches, rare shops, and some excellent cafés. Take a short stroll behind the Pantheon to Piazza della Minerva, where you’ll find the beautiful Santa Maria Sopra Minerva, Rome’s only Gothic-style church. Connected to Piazza della Minerva is Via dei Cestari, which has served as the main shopping street for religious vestments for centuries. It’s fun to browse these shops’ robes, jewelry, books, and other religious objects and is an experience particularly unique to Rome. The area near the Pantheon is also known for its coffee shops. Two good ones to try are Caffe Sant’Eustachio, located on Piazza di Sant’Eustachio a few alleyways to the left of the Pantheon, and Caffe Tazza d’Oro located right off of Piazza della Rotonda on Via degli Orfani. The pedestrian-friendly square of Piazza Navona is a good base from which to begin your first evening in Rome. It is the site of two Baroque fountains by Bernini, the enormous Sant’Agnese in Agone church, and several restaurants, cafés, and boutiques. In addition to being a great place for a relaxed stroll, the Piazza Navona area is one of the hubs of Rome’s dining and nightlife scene. I recommend Taverna Parione (Via di Parione) for a casual dinner among locals and Cul de Sac (73 Piazza Pasquino) for wine and snacks. Both locales are located on side streets to the west of the square.